It’s Friday the 7th of December 1990. The Queen Fan Club Christmas Party at the Astoria on Charing Cross Road in London (it’s not there anymore). I’m with my mates Paul and Steve. It’s a long way to travel for three gauche 19-year-olds from Wigan, but very exciting as it’s our first unsupervised trip to London, with the added prospect of seeing a couple of our heroes in the flesh. I remember nothing of the National Express journey down, but I remember a lot about the journey home. I’ll get to that later. Friends made at previous Fan Club Conventions met, singular drinks purchased (London prices not being compatible with teenage Wigan budgets), and Jacky, who runs the fan club, takes the stage to tell us we’re about to hear three brand new tracks from the forthcoming Innuendo album, not due for release for a couple of months yet, and that we’ll be the first people outside of the studio to hear them. The crowd goes crazy, before falling silently to listen intently to the three new tracks – Innuendo, I’m Going Slightly Mad and Headlong. They go down a storm, Innuendo, in particular, causing particular excitement with its proggy overtones harking back to the early days. The ongoing innuendo-laden press speculation over Freddie Mercury’s health is dismissed by us fans as nonsense because he sounds better than ever. Amazing, in fact. This is a real treat – the internet is a few years away, YouTube even further, so leaks appearing online are a thing of the distant future. It’s hard to convey now just how special it felt to be given this exclusive preview. On the subject of Freddie Mercury’s health, I’m in the toilets just after this and hear two fans fervently dismissing the tabloid rumours about him having AIDS. “Yeah, I mean he looks really thin and gaunt in the photos, but it’s not AIDS. It’s probably cancer or something,” they agree as if cancer is somehow a ‘better’ illness to have. A snapshot of a different, less tolerant era, in which many fans couldn’t handle the idea that their hero might have that disease. Rock Hudson, Liberace, yeah, but not Freddie. No way. There would, of course, be a rude awakening less than a year later. It’s time to announce the winners of the raffle, and who should come on the stage to present one of the prizes than Brian May! This is a surprise, and the place erupts. He’s wearing a very un-rock and roll Christmas jumper and accompanied by his young daughter. And then he’s off, and we’re wondering if he’s going to come on again for the main event. Surely! We’re right down at the front. Roger Taylor comes on with his side project band, The Cross, and they play a few songs. This is the first time I’ve seen him in person, and so close, too. I couldn’t be more happily starstruck. And then, sure enough, they bring Brian May on for a few songs – there, right in front of me, with the Red Special and wearing his trademark clogs. This is the greatest thing I’ve ever seen. He takes the lead vocal for Tie Your Mother Down and forgets the words, but it doesn’t matter because he’s there, just six feet away, and being 19 and from Wigan, I’m just so happy to be there. A couple more songs, including Roger, singing I’m In Love With My Car from behind the drum kit (which I’m close enough to hear unmiked and see the snare vibrate), and then they’re gone. It turns out that Paul and Steve know the brother of the lead guitarist for The Cross, as he’s from Wigan. I didn’t know this. This connection somehow grants us access to the VIP area – a completely unexpected and exciting development, and although I’m desperate for Brian and Roger to be there, I’m told they left as soon as the gig was over. Still, we’re chatting with members of The Cross and Jacky from the Fan Club, and a man called Adrian Hopkins who is in charge of the merchandising holds court as he regales our awestruck faces with tales of life on the road with Queen. He invites us to a party that’s happening as soon as everything winds down here, which is already happening as the bouncers are clearing everyone out. The address is 4 Park Road, Chiswick. We check our collective funds. I have £4.50 on me. Paul and Steve roughly the same. Even though we don’t know where Chiswick is, somehow we know that we probably can’t afford a taxi and we need to be at Victoria to get the coach at 9:30 the next morning. Our attendance at (in our minds, at least) a debauched rock and roll party in an exclusive London residence is very regrettably not to be. This is where it starts to get interesting. Being three gauche 19-year-olds from Wigan, we haven’t really planned beyond the event – you know, like somewhere to stay for the night. This glaring omission is foremost in our minds now, as it’s 2 am and freezing. We don’t have enough money for a taxi, the tubes are shut, so we figure that the best plan is to head to Victoria. This is 1990, so there are no smartphones with GPS, just my A-Z. So I guide us, all wide-eyed through the strangeness of Soho. Central London after midnight on a Friday is an intimidating place, but we make it. We think maybe we can just hunker down in a waiting room, but they’re all locked. We find a security guard and ask him if he could open one, and he refuses point blank, very rudely. We’re quite a pathetic spectacle, shivering in our Queen t-shirts and leather jackets festooned with Queen badges. We plead with him, and he eventually takes pity. He looks us all in the eye and says, “Don’t say I didn’t warn you.” Then he unlocks a waiting room. Within minutes, the reason for the guard’s reluctance becomes frighteningly clear. All sorts of waifs and strays start to stumble in out of the cold. Aggressive, threatening each other, crying, screaming. This is quite a shock to us. Falling asleep suddenly seems like a bad idea, so we desperately try to stay awake, wishing we could make ourselves invisible as the hours' tick slowly by. None of us dare say a word or even look at each other. It is genuinely the most terrifying night I’ve ever spent. Thankfully, we’re left alone, and they all start to peel away as the morning gets lighter. We’re extremely relieved when the coach turns up, and we can’t get on it quickly enough. Surely the worst is over now. It’s about 11:30, we’ve been going at a steady pace, and we’re on the M6 approaching Coventry when it starts to snow. Very thick, heavy snow, coming down so quickly that it actually starts to cover a busy motorway. Within a few minutes, we’re at a standstill. I’ve never seen snow bring everything to a halt so quickly. The opposite lane is still running, probably because on our side the slow traffic on the approach to the slip road for the exit to Coventry has helped the snow settle. Still, I think, we’ll be on our way soon enough. And at least we’re in the warm and there’s a toilet. Several hours later, we haven’t moved and the toilet has backed up. In those days, National Express coaches were double-deckers and had a hostess who served food and did all the announcements. Our hostess, Tina, is very highly-strung and prickly. She’s not handling the crisis at all well. People are hungry and asking when she’ll be serving food, and she says there’s no food on board. A few hours on, Tina’s asleep, so Paul and I quietly open the fridge and find a couple of cucumbers, some margarine and some bread. So we make as many cucumber sandwiches as we can and hand them out while she sleeps. Later, when she wakes up and discovers the bread and cucumbers have gone, she has a huge meltdown. “WHO has STOLEN the food??!! I DEMAND to know!! That is THEFT!! It is a CRIME! !” she yells, and threatens to call the police unless the culprits come forward RIGHT NOW. A wonderful conspiracy of silence amongst the passengers follows, and Tina’s impotent rage in the face of it is bleakly glorious to behold. You may wear the badge and polyester uniform, but you have no dominion here, Tina. Later on, in the early hours, still not having moved, I’m dozing off when I hear a woman screaming, which rouses everyone. She’s woken up to find a man groping her. He’s still standing over her and protesting his innocence, but the look on his face tells a different story. The driver has a phone (which back then was a handset connected to a huge battery plugged into the cigarette lighter in the dashboard), and he calls the police. They arrive quite quickly down the hard shoulder and take him away. Tina doesn’t mention the sandwich theft to them. Sunday afternoon, we still haven’t moved, and Paul suddenly has a brainwave: his dad works for the De Vere hotel group, and maybe if he calls his dad from the driver’s phone, he might be able to sort something out for us. Obviously, Steve and I would have preferred it if he’d thought of that 24 hours earlier, so we might have had more to eat than a cucumber sandwich and not had to use a toilet that is by now a soaking mound of pissy toilet paper and turds. But we keep our counsel. So, he calls his dad. It turns out there is a De Vere Hotel in Coventry, and his dad has a plan. This is where we have to be discreet – we’re the cucumber sandwich heroes and we prefer that status to the traitors who snuck off to a nice hotel and left everyone else to starve. So, we quietly get off the coach and trudge through the snow towards the slip road to see if we can get a lift. There’s a helicopter hovering overheard with the Daily Express logo on its underside, so we wave at it. Local church groups are doing food runs for all the stranded motorists, so we hitch a lift with one of them who drives us on barely drivable roads right to the hotel. We ask him to make sure to get a food package to the coach. The receptionist doesn’t quite know what to make of the three bedraggled figures in the same clothes they’ve been wearing for three days beaming at her as we approach the desk. Paul’s dad has called ahead and pulled some strings, so we’re shown to a very nice room and told that food and drinks have been taken care of if we’d like to make our way to the dining room. Being gauche 19-year-olds from Wigan, we gorge ourselves at the carvery and get absolutely hammered. The joy of our liberation has really gone to our heads. It’s not quite the party we had high hopes of attending at 4 Park Road, Chiswick – there are no rock stars or groupies there, for one thing – but in our own gauche 19-year-olds from Wigan way we’re making up for it. Then the lack of sleep over two nights gets the better of us and the party peters out very quickly. The next morning, train tickets have been arranged for us by the management thanks to Paul’s dad, as has a taxi to the station. The roads are still in a terrible state and we have no idea how the coach is doing, but it’s not really foremost in our minds. It’s probably still there. We’re just happy to be going home. 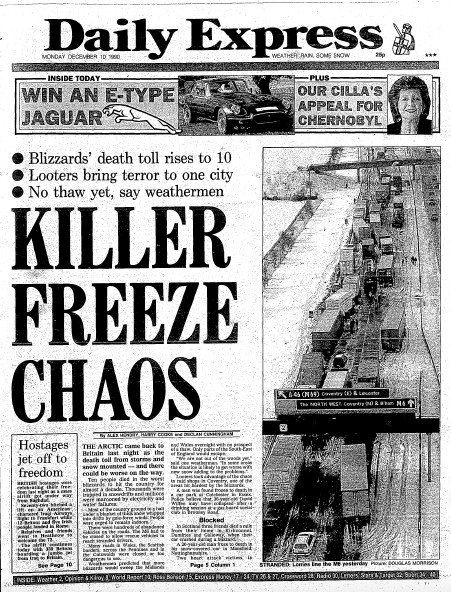 At the station, I notice the Daily Express is running an aerial photo of the frozen motorway on its front page, and a closer look reveals us waving at the camera. We’ve made the front page of a national newspaper! I buy a copy. My parents are very glad to have me home safe. Paul’s dad is thanked profusely for his assistance, most of which can be written off as expenses. My dad is more than happy to write a cheque for the difference. The newspaper is kept safe for posterity but naturally disappears during a clear-out a few years later. And I write a scathing letter of complaint to National Express about Tina’s unprofessional conduct. Over the years I’ve toyed with the idea of writing about this adventure. Not in quite the flippant style in which it’s portrayed here, but that’s the form it’s taken for now. I’d like to think it has its place in the pantheon of rock fan tales, although it’s not quite Almost Famous. What it does have, for me, is a rather displaced “did this actually happen or did I just dream the whole thing?” feeling about it, which I suppose is probably down to the sleep-deprived state I was in for much of it. What it does represent to me is a time when my Queen fandom was at its peak. There’s an added poignancy in the fact that the exclusive tracks we heard at the party were amongst the last that were released during Freddie Mercury’s lifetime, a swansong that showcased a creative renaissance inspired by circumstances we, as loyal fans, were unwilling to acknowledge. Because, despite all the ardent fanboy dismissals of the tabloids’ alleging Freddie had AIDS, that, of course, turned out to be true, and less than a year later he was dead. In those pre-internet days, being part of the group hearing those new songs for the very first time carried with it a genuine feeling of being in on something the masses weren’t, a real gift from the band of the sort that just doesn’t seem to happen these days. Say what you like about Queen and their music, but in their day they knew how to treat their fans.